A superb example of an antique tramp art box. 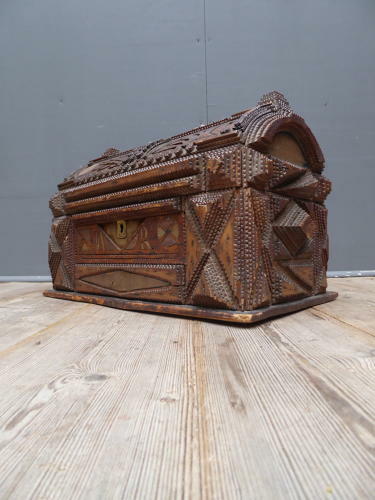 A beautiful & early piece of tramp art, the dome-top box intricately layered in the traditional manner with notch carved wooden strips & velvet covered panels. The variation of technique on the box is outstanding, the front is finished with fretwork panels & a brass escutcheon and the top with an ornate brass handle. Tramp art was made by untrained artisans during the 19th & 20th century & was made using easily obtained materials such as cigar boxes, natural wood & reclaimed fixtures & fittings. This piece is a wonderful surviving example of such work. Wear commensurate with age with associated losses which do nothing to detract. Unrestored.